Last week, Ladypants brought back a box of biscuits from trip to Georgia. Real, southern biscuits, a treat I'd not previously enjoyed. After enjoying a few buttery mouthfuls, they went right into the freezer to keep them as fresh as possible. And then it was the weekend and time for brunch. A culinary blasphemous idea struck me. 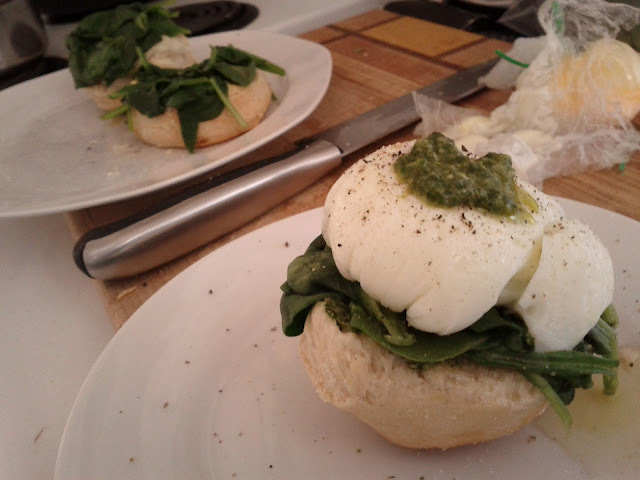 A biscuit version of eggs florentine. I decided against making hollandaise sauce when I read the recipe and nearly gagged at how much butter was in it. The biscuits are buttery enough, so adding more would be redundant to the point of overkill. Instead, I replaced it with a basil pesto. Delicious! A bit messy to eat, especially if you end up with one of the biscuit tops. I'd make these for brunch again in a heartbeat. They would be pretty quick to whip up for a crowd too. Mmm... that was super delicious. I won't complain if you make it again!